We were generally impressed with the quality of food in Mediterranea's two free dining venues, particularly the main dining room. The food comes from an Italian perspective, so think plenty of pasta (the ship stocks at least 20 different shapes, and the galley makes its own fresh gnocchi) and expect some menu items you might not see on other ships, such as octopus, rabbit and Carpaccio (a raw beef appetizer). Many supplies are sent from Italy -- no matter where the ship is stationed -- and preparations are representative of how the dish is served in Italy (for example, Bolognese meat sauce doesn't contain tomatoes), rather than an Americanized version of Italian food. Items more familiar to American diners -- chicken breast, baked potatoes, grilled salmon and Caesar salad -- are all available on request, as are gluten-free items. The line recommends that anyone with a restricted diet should note this when booking. If you plan on ordering drinks anywhere on the ship, Mediterranea offers a number of beverage packages for purchase. They range from water-only packages to "all-inclusive" packages for beer, wine, alcohol, coffee and soft drinks. Restaurant degli Argentieri (Decks 2 and 3): This is Mediterranea's main dining room, seating 1,340. The majority of tables are on the main floor, located on Deck 2. The Deck 3 seating is on a large balcony, which has an oval opening onto the lower floor; the two levels are connected by a curving staircase. 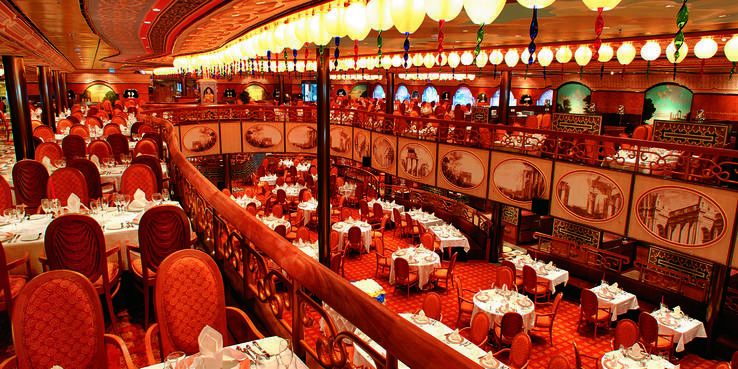 Decor is in keeping with the ship's exuberant Italian palazzo theme. Expect nearly every surface to be covered with a pattern or curlicue. Lantern-shaped lights decorate the ceiling, and illustrations of ancient Roman ruins ring the walls. The center of the ceiling has a trompe l'oeil mural that looks as if you might be lying on your back in the Roman Forum, with the tops of monuments and a blue sky filled with puffy clouds. Breakfast, lunch and dinner are served here, with open seating during the first two meals. At dinner, tables are assigned for the duration of the cruise, and there are two seatings. For European sailings, seatings are at 7p.m. and 9:30 p.m. or 7:30 p.m. and 10 p.m., depending on the ship's location; for Caribbean sailings, seatings are at 6 p.m. and 8:30 p.m.
You can sign up for your dinner location (upstairs or downstairs), table size and preferred seating time online, prior to departure. Tables on the balcony level are quieter, but if you want to be in the center of the action for theme nights, when desserts are paraded through the dining room by servers wielding fireworks, conga lines snake among the tables and waiters put on a dancing, twerking extravaganza, the main floor is the place to be. At breakfast, there's a buffet area with pastries, scrambled eggs, bacon, sausage, cereal, yogurt, cold cuts and fruit. In addition, you can order items from a menu, including eggs, pancakes, hot cereals and smoked salmon. We found this restaurant to be a calm and efficient choice for breakfast, compared to the more crowded and chaotic buffet restaurant. Breakfast hours vary, but usually begin at 7:00 or 7:30 a.m. and end by 9:30 a.m. (occasionally earlier). Lunch at Restaurant degli Argentieri is particularly good, probably due to the fact that many Europeans consider lunch to be their main meal of the day. On the menu, you'll find two appetizers, salads (we particularly enjoyed a Nicoise-style salad one day), soup, a pasta course, a specialty salad and two meat- or fish-oriented mains. There's also a single vegetarian main course selection (many of the pasta course offerings are also vegetarian), and a hamburger is always available. Dessert includes two plated options (one with no added sugar), fruit and sorbet or gelato. Lunch hours vary (they're listed in the ship's bulletin), but usually span an hour and a half. At dinner, the menu categories are much the same: two appetizers, one soup, one salad option, and four mains, including a vegetarian option. We noticed that vegetarian mains tended to be on the small side, often more of what you'd expect an appetizer portion to be. The daily pastas were a menu highlight, and meats were generally tasty and accurately cooked, when level of doneness was an option. However, in our experience, fish was generally overcooked. We dined on braised beef, meltingly tender leg of lamb, rabbit, chicken, tuna, cod and swordfish. The cheese course offers three changing varieties per night; all we tried were tasty. The dessert menu offers three plated choices (including a sugar-free option), plus fresh fruit and gelato; choices range from Italian favorites like tiramisu, cannoli and cassata (cake with candied fruit), to other European standbys like a chocolate tart or Catalan cream (creme brulee without the burnt sugar topping). At both lunch and dinner, there's also a special section of the menu that features "Italian favorites." These include pasta Bolognese, minestrone soup, Caesar salad, cod with vegetables and a chicken breast with tomato sauce. As you might guess, the wine list focuses on Italian bottles. There are also wines available by the glass, plus a red or white choice served in half-liter carafes. There are no sommeliers or wine stewards in the dining room. U.S. passengers automatically receive the "USA Water" option (designated on the reverse of their ship card) when they book a voyage, which entitles them to water by the glass (without surcharge) in the main dining room. Perla del Lago Buffet (Deck 9): The 570-seat buffet restaurant sprawls in the center of Deck 9, which it shares with the outdoor Lido Deck on either side. It operates during breakfast, lunch and for late-afternoon sandwiches and pastries. There are four different food lines along two facing walls, serving both hot and cold dishes, plus a fifth line behind a wall in the space adjoining the main service area. Out on a covered section of the Lido, you'll find a made-to-order pasta station and a grill area that operates at lunch and sometimes serves as an extra egg station and buffet line during breakfast. A small, unmanned counter tucked into one side of the restaurant advertises healthy fare, which consisted of fruit on our voyage. An area just inside the main entrance offers self-serve coffee, water, ice, milk (both cold and hot) and orange drink. In addition, at breakfast, cold cereals, yogurt and fruit selections are located here; at lunch, it's home to plated desserts and soft-serve ice cream machines. There are also two smaller drink lines located on the Lido and with the fifth interior food line. Although a map is posted at the entryway, the restaurant's set-up is disorienting. By the time you've collected the various dishes you desire from the different areas, it's a sure bet something that's supposed to be hot will have gone cold. At breakfast the drinks area is a mosh pit. Some items appear on more than one line, but others are only served in one place. Seating is plentiful; we were never at a loss to find a spot. Many tables are next to windows, which makes for nice sea views. You also have the option to take your plate outside to shaded tables on the Lido Deck. At breakfast, there is typically only one made-to-order egg station, usually manned by a single, hard-working chef, who cranks out both omelets and sunny-side ups. As you might imagine, waits can easily be 10 minutes at peak times. For the frustrated, the end of this counter offers pre-made scrambled eggs, bacon and breads. Another breakfast line features items like smoked salmon, sardines or pickled herring; sliced ham, mortadella and salami; hash browns, pancakes, French toast, sauteed mushrooms, bacon, sausages and scrambled eggs; a mini salad bar; plus an assortment of pastries and breads (including excellent focaccia). At a third line, you'll find salami, prosciutto, cold cuts, sliced cheeses, salad items, rolls, sliced bread and focaccia. Finally, there's a pastry counter that features croissants (plain and filled with custard or Nutella), pain au chocolat and cinnamon rolls, plus fruit. Lunchtime brings a carving station on one line, usually offering two items, such as turkey breast and beef, along with vegetables like broccoli and carrots. Another features casserole-style pasta dishes (we fondly remember a wicked lasagna made with smoked salmon and bechamel), vegetables and breads. A third offers a small salad bar, followed by baked fish or meats and vegetables; this line also serves ethnic dishes, which included Greek favorites one day, and Mexican or Indian dishes on other occasions. There is a counter with antipasti, like marinated sundried tomatoes, olives, cheeses, prepared salads and breads, plus another with pizza by the slice, usually featuring two pies. We particularly enjoyed the antipasti, but the pizza's flabby crust was a disappointment. The Lido grill area serves beef or chicken burgers, sandwich components (cold cuts, cheese, grilled eggplant and other veggies), fries and desserts. Lunch hours vary, with some of the lines opening as early as 11:00 a.m. on certain days, but with all of the areas usually open at least between 12:30 and 2:30 p.m. The Lido grill area usually serves until 4 p.m., and pizza slices can be also found in the buffet until 4 p.m. After that, cookies, pastries and small tea sandwiches are set out on one line, with service until 6 p.m.
Room Service: A room service menu can be found in the cabin information manual. It offers sandwiches, salads, soup, fruit and a daily dessert. A room service continental breakfast can be ordered via a door-hanger the night before. For Classic cabins, there is a $2.50 charge for each room service delivery during Caribbean sailings and a 5 euro charge during European sailings. For Premium cabins and suites, it's complimentary. Room service operates 24 hours a day. Mediterranea's two fee-dining options are at opposite ends of the spectrum. One is a pizza cafe, the other an elegant, high-end restaurant. While the pizza spot was a bit disappointing ("Why do we have to pay extra for pizza?!" is the usual passenger gripe), the refined Club Medusa experience was well worth the extra expense. Club Medusa (Decks 10 and 11); $33.50 (Caribbean) or 25 euros (Europe) including service charge: Located in an elegant, understated round room, with a balcony overlooking the main floor, the 99-seat Club Medusa is well worth the up-charge. It serves dinner from 6:30 p.m. to 9 p.m. The unchanging menu begins with an antipasti course (Serrano ham with tomato bruschetta, Carpaccio, tiger prawn cocktail, iceberg wedge or chopped salad); followed by two pasta choices (with clams and pistachio pesto or vegetables in carbonara sauce) and a risotto with pear and pecorino cheese (one of the most delicious, perfectly cooked risotto dishes we've ever had). Mains include lamb chops; a massive grilled rib-eye steak; salmon with orange-herb sauce; sea bass baked in a sea salt crust; a vegetarian wild mushroom and chestnut cottage pie; and surf and turf with beef tenderloin, tiger prawn and sea scallop. We ordered the surf and turf, and found that each element (even the hard-to-get-right scallop) was perfectly cooked. You can choose from seven sauces to accompany your main course, ranging from basil mayonnaise to porcini mushroom, as well as vegetable side dishes. There's also a five-course wine-pairing menu, which offers more limited selections from the main menu, each matched with an Italian wine by the glass -- most of them DOC. The supplement for all five wines is $17.50. The restaurant really shines when it comes to desserts. There's an amazing semifreddo (a frozen dessert that's like a cross between mousse and ice cream -- just order it! ), a molten chocolate cake with rum-raisin ice cream and cannoli as good as any we've had in Sicily. On the less decadent side, you'll find a berry parfait or fresh fruit. There's also a cheese plate. Gold- and Pearl-level members of the Costa Club receive a free meal at this restaurant when traveling in a suite. Posillipo Pizzeria (Deck 9); $8 (Caribbean) or 4 euros (Euorpe): In the evening, from 6:30 p.m. until midnight, a section of the Perla del Lago buffet restaurant is converted to a pizzeria, with checkered tablecloths and a menu of pizzas, a salad bar and desserts. The pizza is Italian-style thin crust, with less lavish toppings than Americans might be used to. Pies include the classic margarita, with a light tomato sauce, a sprinkling of cheese and fresh basil, or cheese with prosciutto, as well as other Italian classics. We talked with several U.S. passengers who were unhappy with their experience at this dining option. The main complaints were the lack of toppings and a less-than-crispy crust.